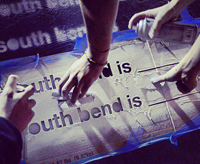 In a single week, the students brainstormed, conceptualized, created, and exhibited three public, interactive art projects designed to help bridge the gap between downtown South Bend and the Notre Dame campus. “It’s amazing what you can get done when you don’t have time to self doubt,” says Alisa Rantanen, a senior industrial design major. Robert Sedlack ’89, an associate professor in the Department of Art, Art History, and Design, and designer John Bielenberg—who has orchestrated several other socially-minded design blitzes around the country—teamed up to organize the students’ event. To kick off the project, students headed into the city to explore the area and conduct interviews with residents. The students next broke into groups to develop three distinct projects: a “bus” made of PVC piping, a free public viewing of an original YouTube film, and an interactive chalkboard display. They put their plans in motion with help from Aaron Perri, executive director of Downtown South Bend, Inc. 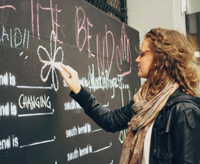 The students working on the interactive display used special paint to turn the side of a parking garage into a giant chalkboard and then stenciled prompts on the wall to initiate discussion. “We wanted to create a place where South Bend community members could be heard in an unusual way,” Rantanen says. 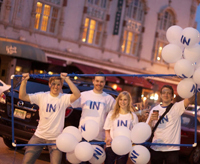 After building the PVC bus frame, the students “ran” the bus from campus to downtown, depositing balloons at various local businesses, restaurants and landmarks. They also filmed the entire process and created a short video calling for a new bus line between campus and downtown South Bend. The third group created a 10-minute movie and projected it onto a wall behind the Morris Civic Theater. Creating and presenting all three projects in such a short time was grueling and intimidating, say participants. For five days they worked intensely and sacrificed sleep—but ultimately produced well-conceived and interactive design projects. The combined stress and satisfaction of the blitz experience was also transformative on a more personal level, says Rantanen. “Before doing this, I felt like I was in a design rut, and I wanted to get shaken up,” she says. Bielenberg, co-founder of the “rapid ingenuity” firm Future Partners, says the Notre Dame design students “were smart, engaged and passionate about this project. While the design blitz was intended to last only one week, it struck a chord with participants. Inspired by the experience, a number of students are now petitioning for a bus that goes directly from campus to downtown—and discussing future projects. “We’re hoping to make another appearance downtown or use the outdoor projection idea to advertise things going on in the community as a source of entertainment for people, ” says Brandenberger. Originally published by Eileen Lynch at al.nd.edu on February 05, 2013.